Lina Johansson Design's posters from Sweden stand out because of their sturdy colours. Often black and white with graphic patterns, like the blackbirds on a line. Typically Scandinavian geometric shapes and graphic patterns. Of course we like ♥ there. Lina Johansson Design fits perfectly into our collections. We even discovered Lina Johansson and are the first Dutch shop where you can order the beautiful collection! Lina Johansson has been working from her Stockholm studio since 2012. Lina Johansson's posters are printed on a sturdy 250 gram silk mat paper (the larger posters are printed on 240 gram matte certified paper). Although she also makes posters with pastel colours, such as the bird, most posters are in black and white and a solid colour. 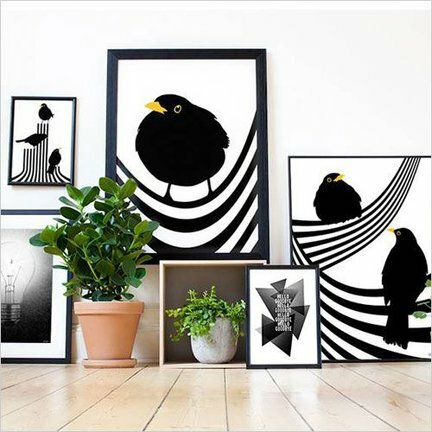 The 'kungs' for example, the high-contrast posters with blackbirds.